Nissan Motor Co., Ltd. today unveiled an all-new sedan model at the 8th China (Guangzhou) International Automobile Exhibition. Using the famed ‘Sunny’ name in China, this new model will go on sale in China in January 2011 and then progressively across 170 countries worldwide including Australia under different vehicle brand names. Ever since the introduction of the Nissan Tiida, local Nissan dealers have been calling for the return of the highly regarded "Pulsar" name. This car, the new Sunny, is likely to be it! The Nissan Sunny was first introduced in China in 2003 and was significant as the first locally built model from the new Dongfeng Nissan partnership. The Sunny quickly helped establish the Nissan brand in the passenger vehicle market in China. Combining the proven Nissan 1.5-litre HR15DE engine with dual injectors and a new-generation Xtronic CVT with an auxiliary transmission, Sunny delivers ease in handling for city driving. MacPherson struts are used for the front suspension and a torsion beam for the rear suspension, making for sporty and agile driving at low speeds,and steady and stable driving at higher speeds. 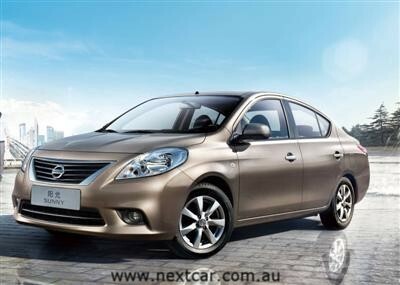 The new Sunny will be produced in Dongfeng Nissan’sHuadu Plant in Guangzhou for the Chinese market.